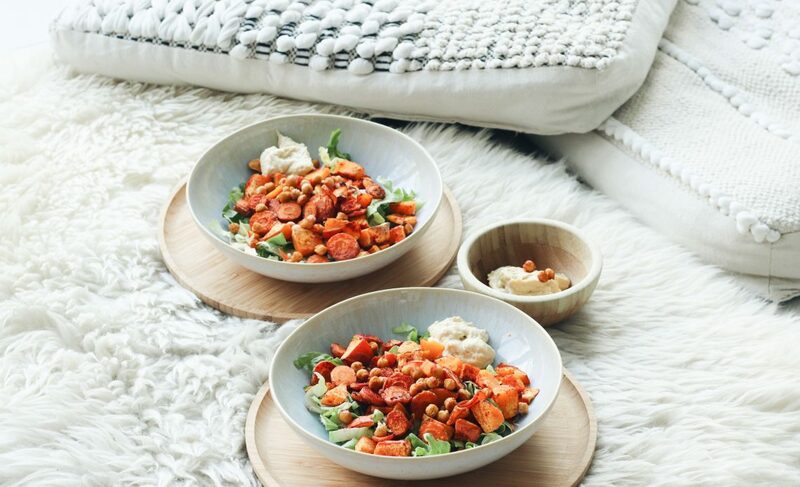 Who thought salads weren’t for winter was wrong! This is the perfect recipe to keep eating salads during winter. In fall and winter season pumpkin is my best friend. I really love the taste of pumpkin and there are so many ways to prepare it! Besides that it’s super beneficial for your health. Pumpkin contains a lot of vitamin A which is very good for your skin. Next to the huge amount of vitamins and minerals and omega 3 it’s just super yummy! So after a lot of questions about my recipes on Instagram, I decided to share them on my blog and I really wanted to share this winter salad with you guys. It’s an easy recipe which is super nutritious and filling for the colder days. 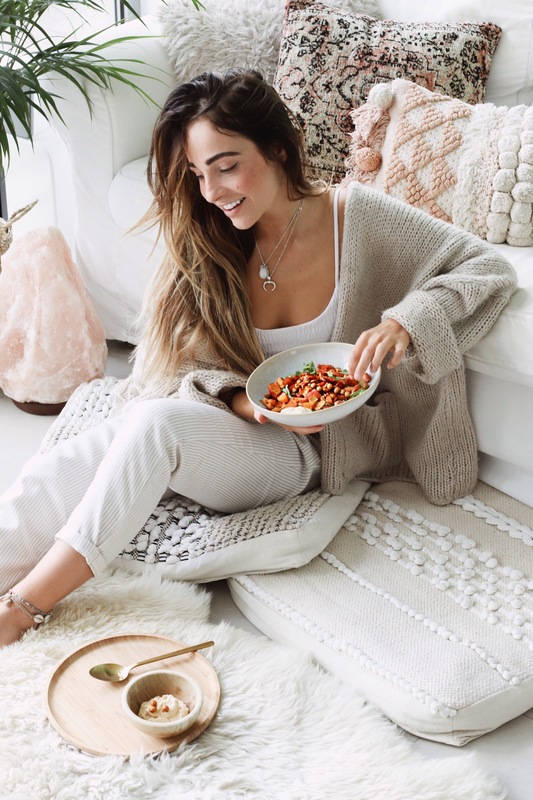 Your body will need more energy to keep you warm, so it’s very important to feed it well. 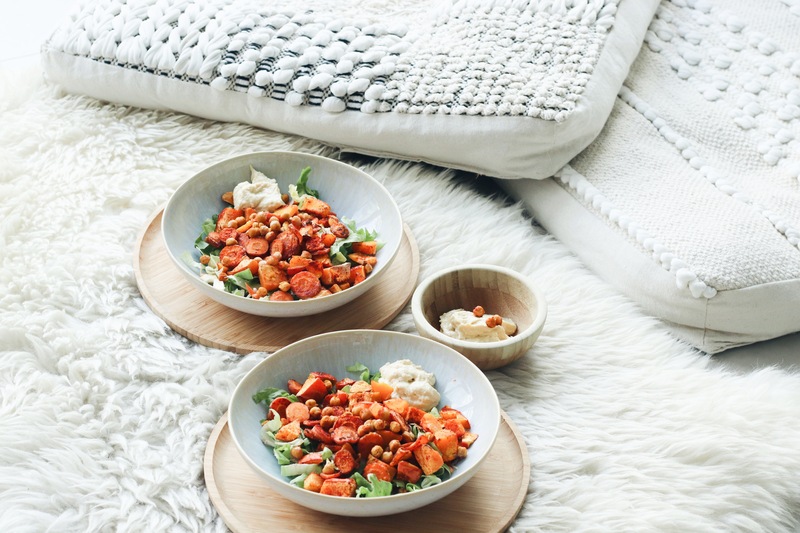 Just fill up your oven plate with cut carrot, pumpkin and chickpeas. Make sure you wash your canned chickpeas before you eat them (so you won’t fart haha). Sprinkle some olive oil over the vegetables and the roasted paprika powder & garlic powder. leave it in the preheated oven (220°C) for 20 minutes. You can already fill your plate with the rocket. After 20 minutes you get the vegetables out of the oven and add it to your salad. I like to add salt and a big spoon of hummus of your choice. Voìlla! Easy, healthy and delicious lunch is done!